A look at carpets by Joseph Carini inspired by the ceramic work of Yuki Hayama. Joseph Carini Carpets hosted the debut United States exhibition of ceramic works by Japanese artist Yuki Hayama from 9 September through 29 September 2016 at Mr. Carini’s eponymous TriBeCa carpet showroom. The showroom served not as mere gallery to the magnificently detailed work of Mr. Hayama, but rather as a veritable collaborative studio in which hard – in the form of ceramics – was juxtaposed against soft – in the form of the carpets Joseph Carini designed after being inspired by Mr. Hayama’s work. A visual delight where the contrast of two (2) disparate artistic endeavours begs the viewer to delve deeper into the notion of creativity, inspiration, and a true understanding of craft. It was due to the fortuitous timing of the show’s opening, corresponding with both The Rug Show and the New York International Carpet Show (NYICS), that I was able to view the exhibition for myself, and was treated to a guided private tour by Shoko Aono, Director of the Ippodo Gallery in New York who organized the exhibition. This is what I thought. 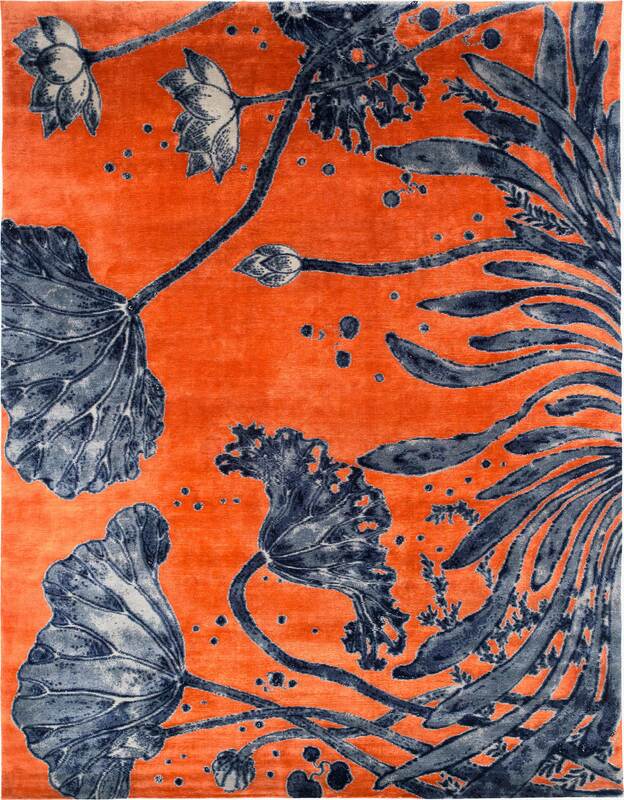 ‘Water Flowers’ carpet by Joseph Carini Carpets inspired by the work of Yuki Hayama. | Image courtesy of Joseph Carini Carpets. 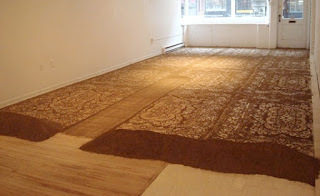 Truthfully, rug and carpet showrooms all – more or less – look the same. Some of course are tidier than others, some cleaner, but the basics are the same. Some form of stacks of carpets, some sample displays, lots of wool, and that unmistakable showroom smell. (If had my own signature cologne, it would smell of a rug showroom and bourbon but, I do digress.) They are also – more or less – filled with things that are not easily broken. I have spent my twenty some years in this industry clumsily gazing at carpets never once worrying if I was going to ‘break’ something in one of my many stumbles. Then of course I walked into Joseph Carini Carpets. ‘Water Flowers’, ‘Aquatic Life’, ‘Ten Thousand Flowers’ all beautiful carpets displayed on the walls, dramatically lit, all begging to be touched and admired. But then, as if one class of objets d’art was not enough, in front of each carpet was a ceramic work of supreme detail and craftsmanship, such as the piece ‘Fish and Aquatic Plants Motif’ by Yuki Hayama set against ‘Sea Tangle’ by Joseph Carini as shown in the banner image above. An anxious calm came over me as this soothing and meticulous display appealed to my unrealized minimalist sensibilities while simultaneously I worried by shoulder bag could, with an errant turn, render me the owner of a pricey pile of broken ceramic. My senses thus heightened, I turned my attention to examining both the carpets and the ceramics. 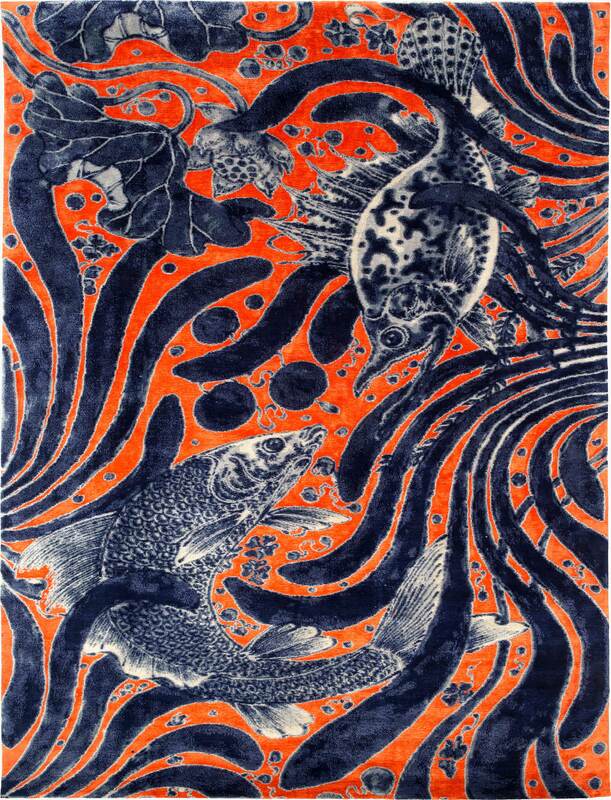 ‘Aquatic Life’ carpet by Joseph Carini Carpets inspired by the work of Yuki Hayama. | Image courtesy of Joseph Carini Carpets. 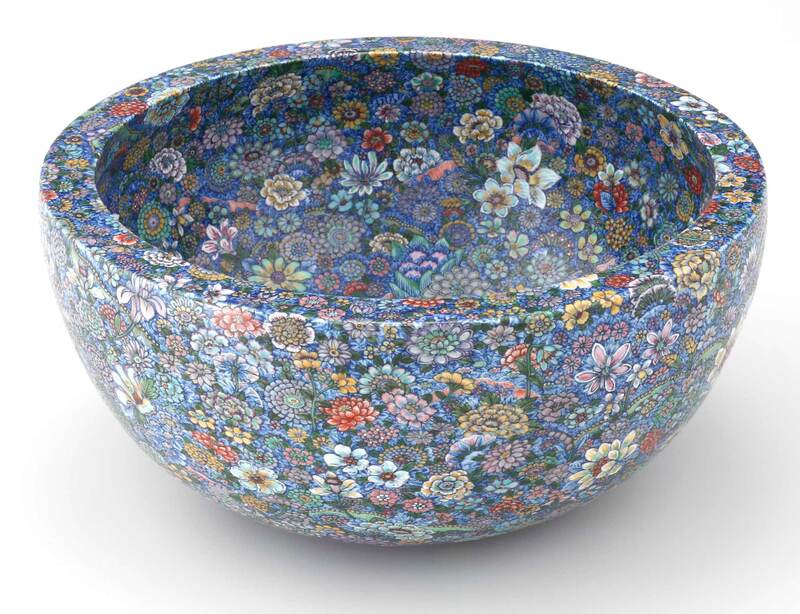 Bowl with ‘Ten Thousand Flowers’ Motif by Yuki Hayama. | Image courtesy of Joseph Carini Carpets. There is a harmony between Hayama and Carini. 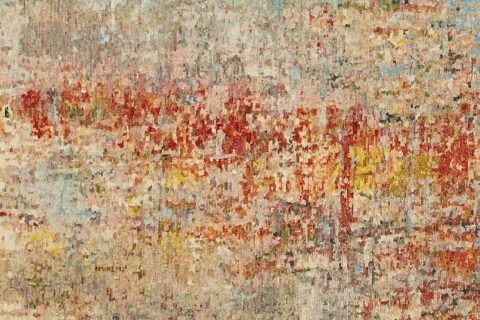 For anyone with an appreciation of the carpets of Joseph Carini, the parallels between the two (2) are obvious. The study of ancient and time honoured techniques, the influence of this ephemeral time, and the creation of objects of permanence that serve to ‘positively influence the atmosphere and the people around them.’ to quote Joseph Carini Carpets. With this latter sentiment we are forced to examine the nature of these ceramics and carpets. To exist solely as ‘Art’ (in the Ars Gratia Artis sense) from a contemporaneous perspective is to bring into question the world around us all, to provoke, and to inspire. To exist as a decorative art – which I for one believe to be the nobler of the two (2) arts, if only for the ever so slight practicality of it – and to do so with the attention to detail, care, and desire to be in harmony with nature is to elevate the standing of the decorative arts beyond that of relatively mass produced wares and a penchant for the disposable. Objects whose inherent qualities lend themselves to metaphorical and often literal lifetimes of use need not be designed with the banality of the lowest common denominator in mind, but rather with a nod, no an ode to the abilities of mankind and our desire to leave a mark on this world. 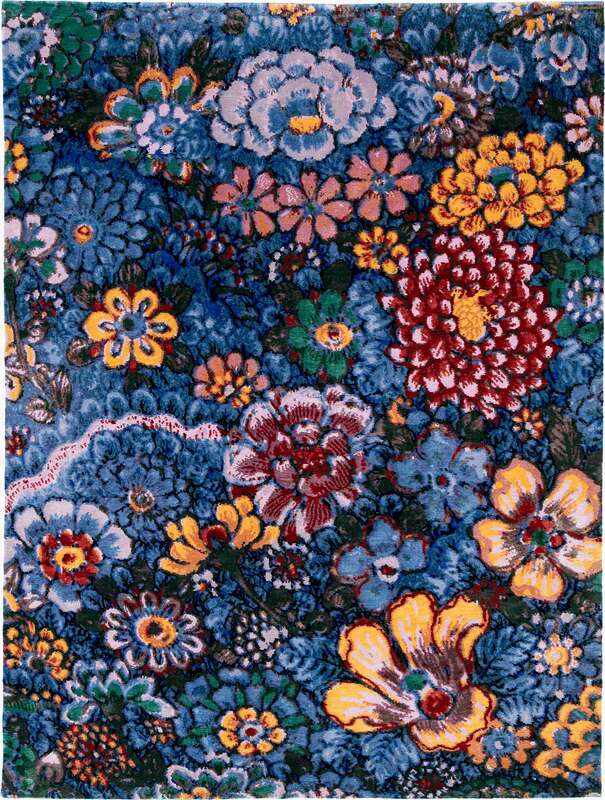 ‘Ten Thousand Flowers’ carpet by Joseph Carini Carpets inspired by the work of Yuki Hayama. | Image courtesy of Joseph Carini Carpets. This is a universal conundrum faced by the worlds of handwork and handmade. How does society value what humans can do purely by hand and in harmony with nature versus what humans can do via our industrial abilities and ability to exploit, both nature and our fellow man? With no readily apparent ‘correct’ answer to this rhetorical question, I propose the solution to the preservation of art, of craft, or work not unlike Mr. Hayama’s and Mr. Carini’s, is to foster a love of individual aesthetic beauty without confining ourselves to predisposed societal notions of what that aesthetic may be. In other words: Embrace individuality and the uniqueness handwork can provide whenever possible. 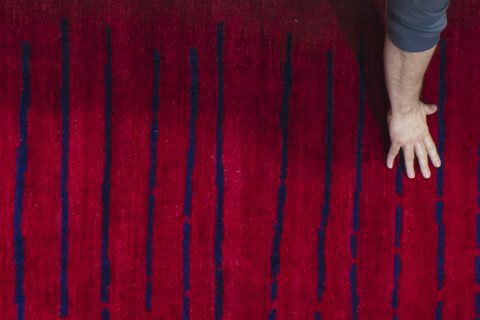 Ms. Aono’s words succinctly, if not also with a bit of literary embellishment, perfectly describe the relationship between western carpet designers and the eastern regions – in this case Nepal – where they are made. The overt gesture to this symbiotic relationship barely touches on the immense debt we, as aficionados of handwork, owe to those who make real what we design and imagine. As ‘destined’ as mankind or even the civilization of this time may be to vanish from the Earth, let us endeavour to create beauty instead of destruction, so that those who come after us know the good of which we are capable instead of the malice.